Andreas Harsono is one of the Indonesia’s most controversial journalists, but even a stint in prison has not stopped the recipient of Harvard’s Nieman Fellowship from writing about human rights and fighting for justice. In an interview with Dyah Paramita first published in The Jakarta Globe, the veteran writer explains why he thinks it is important to celebrate cultural diversity, what he’d like to hear from U2 if they ever come to Jakarta and how Gus Dur earned his respect despite falling asleep during an interview. Question: What makes your writing controversial? Answer: Over the last 10 years, my main job has been writing stories of up to 50,000 words, called long-form writing, which take months to research and are quite costly. Such work allows me to get to the bottom of an issue, which is why I advise that research is as important as writing. This method results in me writing only two or three stories a year. But for more difficult issues, I still release short reports. I also still write features and interviews. Q: Are human rights issues your sole passion in journalism? A: In the past, I wrote about corruption and conflict in general, but later I became more specialized in human rights issues, like those in Aceh, East Timor, West Papua, Java and Burma. I realized that I’d had that passion since I was in second grade, when I admired many human rights activists. Q: Did you feel threatened when you were detained in East Java, because of your work on discrimination against Shia Muslims? A: I see threats and condemnation as part of a process Indonesia has to go through to respect human rights. Nowadays we have more free space to express our opinions, though of course there are many who use hate-speech. In East Java, I was accused of pitting one ethnic group against another, and undermining the republic. But like Gus Dur [former President Abdurrahman Wahid] once said, “Gitu saja kok repot?” [Why sweat the small stuff?]. My mentor, Goenawan Mohamad, told me there are two similar words in Malay, one is takut [fear] and the other takluk [surrender]. Takut is natural but takluk is not. I may be fearful but I’m not going to surrender. Q: What about the risks to your family? A: When I publish a “dangerous” story, I usually tell my wife about the risk, and she responds, “You do your job, go ahead.” I once even wrote a story that might have affected the company she worked for, but she gave me the same response. Luckily, nothing bad has ever happened. 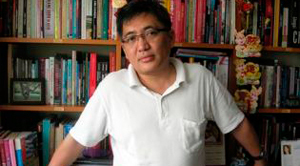 Q: Is freedom of expression still rare in Indonesia? A: Legally, there are spaces for free expression. But there are more than 100 statutes condemning it. Just look at how many human rights activists face prosecution because of their work. Q: We are in the era of citizen journalism. Any thoughts? A: This is one of the best times for journalism. In the past, publishing a story required a printing machine. Now we have blogs and Twitter, which function like a news wire service. But at the same time we are risking a “tsunami of information.” We can drink a glass of water, but we can’t drink a tsunami. I mean that everyone involved in writing needs to learn democracy along with journalism since many are just voicing hatred, rumors and even teaching bomb-making. Q: Care to share any little-known facts about yourself? A: I love Beethoven, Queen and U2. Twenty years ago I used to be the lead singer in a rock band. I took a music course at Harvard. Q: Any chance you like U2 because of their activism? A: I leaned about U2 in 1985.